Not too much has changed in the code from my first preview of March of the Eagles in November 2012, so I'll concentrate on the glorious campaign of the multiplayer master class event at the Paradox Convention last week. I don't usually play the big bad guys. There's too much of the underdog in me, I suppose. 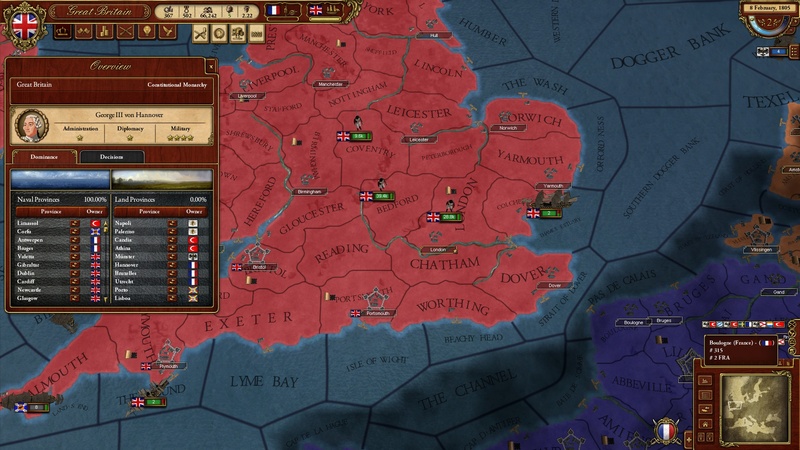 But when I was given first choice in what faction I wanted to play in a multiplayer match of Paradox's upcoming Napoleonic war-simulator March of the Eagles, I went with my gut. 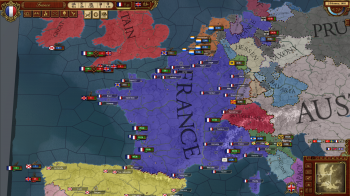 "I'll be France," I blurted out. 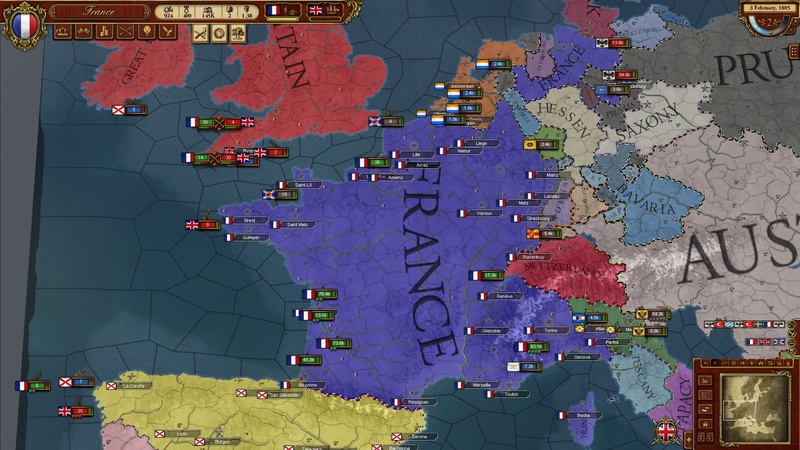 If you're going to test a game from that era, you have to see what it's like to be Napoleon. The next two hours was a master class in how to slaughter my own Frenchmen in the futility of war. 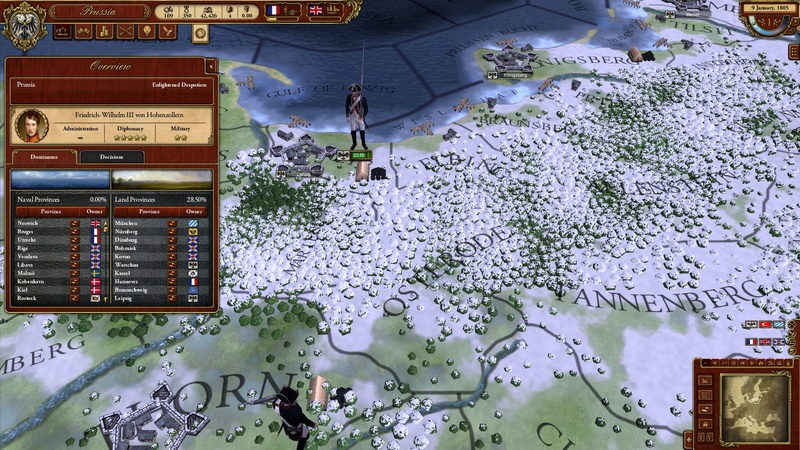 France didn't lose any ground in Europe, but it took nearly 300,000 casualties to claw my way to a stalemate on the continent. You see, I made two big mistakes early on. First off, Austria inadvertently declared war on my vassal, Bavaria, and drew me into a continental conflict. The Grand Armee of Napoleon was in the north of France and rather than wait to move it south to engage Austria, I declared war on Prussia. 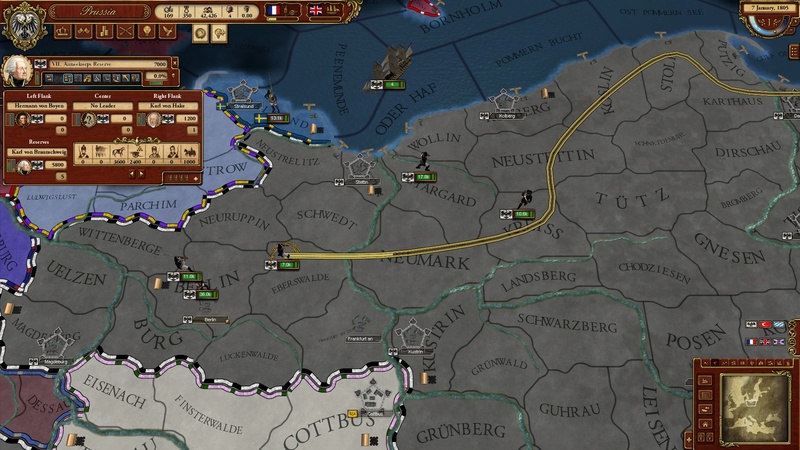 That created a coalition of the German people united against France for the better part of the session, and they proved a worthy adversary. 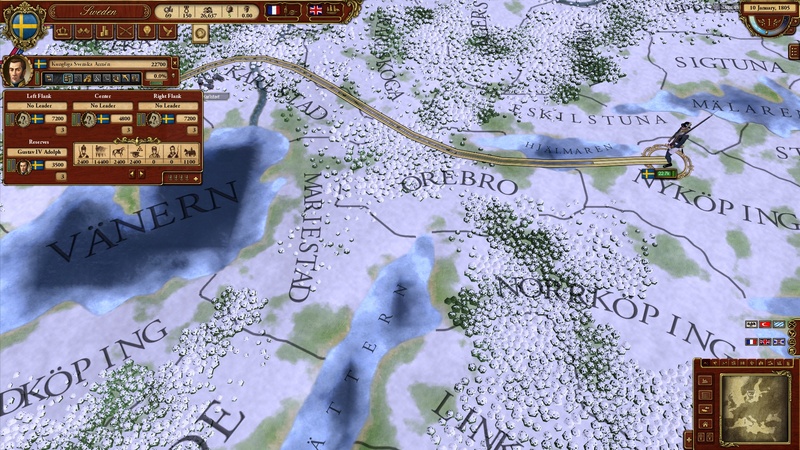 Well, Napoleon wasn't exactly a brilliant diplomat, and I didn't use the diplomacy system very subtly. 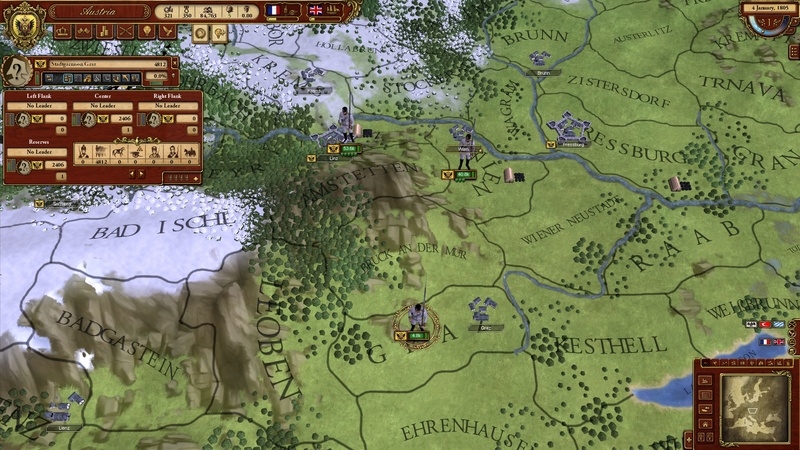 The second mistake I made was to leave my large southern army without adequate leadership to be slaughtered by an equal-strength force of Austrians. 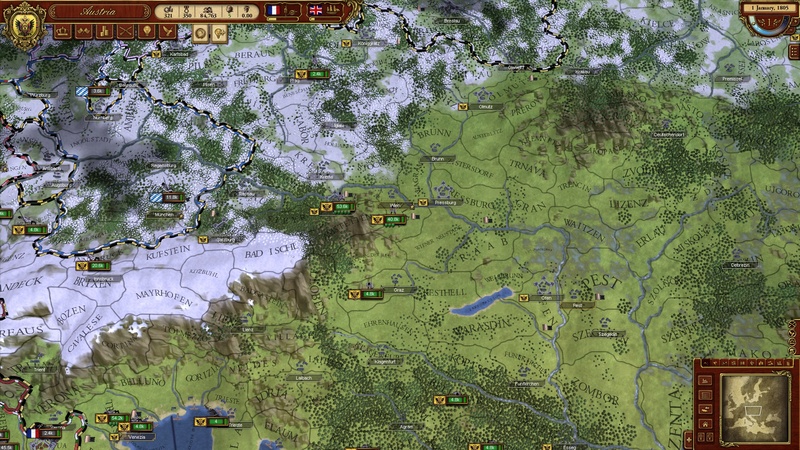 France begins the game with a large pool of very skilled leaders, but I'd missed the fact that you must assign them to the proper flanks of your army, preferably before a well-led Austrian force descends upon them in Milan. 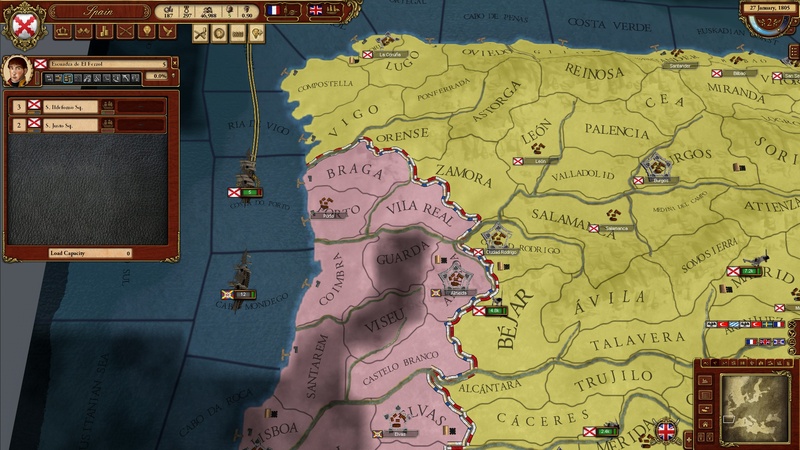 Over the course of the game your leaders will develop traits that provide bonuses. The static bonuses are helpful, but you can't ignore the specific tactics your leaders learn. In order to take advantage of them, you need to fulfill certain requirements in the flank they command in order to succeed. If I hadn't ignored that I had a brilliant cavalry commander with the Punch tactic at his disposal leading nothing but infantrymen, the Grand Armee might have fared better. Of course, I have an excuse. 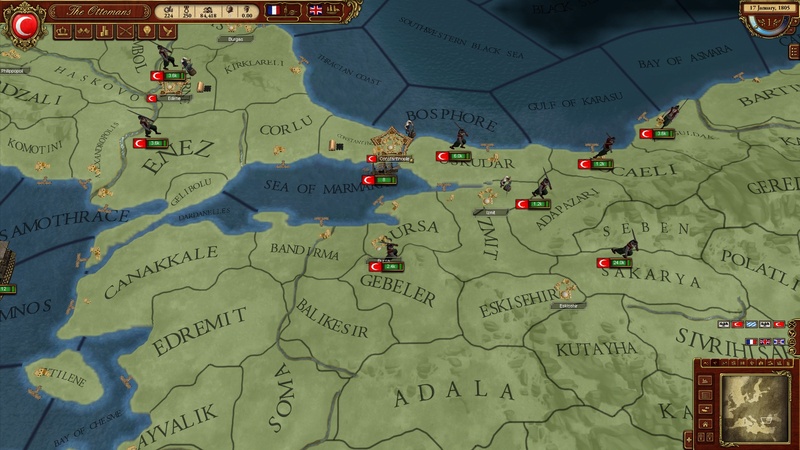 Playing multiplayer usually means you leave the speed of the game steady and don't allow pausing by players - even though that's a hallmark of Paradox's grand strategy games. I understand why we kept playing without pausing - you need to keep the game moving and if all 8 human players had the freedom to pause it would crawl forward at a snail's pace. But the frantic nature of multiplayer didn't leave me much time to micromanage my armies as much as I'd like. Perhaps if the interface was accustomed to a more easily hotkeyed experience like StarCraft, it would make for a happier Napoleon. The large French army of more than 180k troops was soon caught in Bavaria by a combined force of Prussians and Austrians. The rivers ran thick with blood as French bodies piled up. Napoleon fled home to Paris to raise another army, but the war quickly turned into a defensive conflict for me. 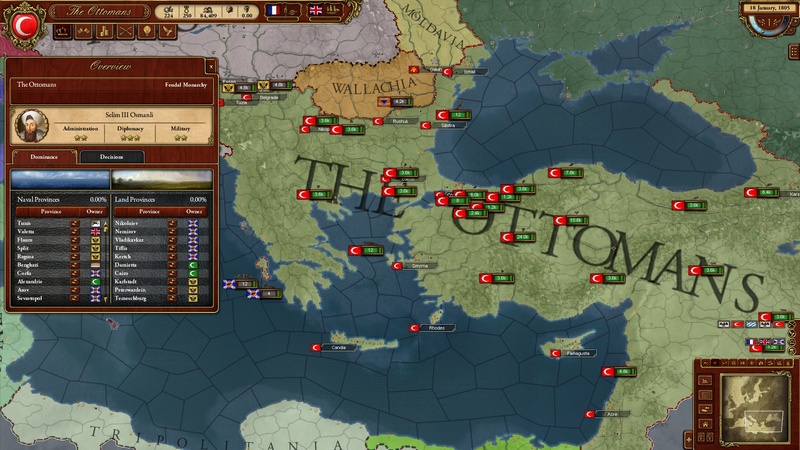 Luckily, the Ottomans and Russians declared war on the Austrians and Prussians respectively so German attention was pulled away from rampaging the French homeland. Thank the God of War for the human players of Turkey and Russia - if they hadn't interceded, it could have gone very bad for France.